A visit to Antique has been long overdue, and all it took was a little push from friends to finally come and explore the province. And I’m glad I went because spending six days all over Panay Island was quite memorable, as it blessed me a week filled with amazing travel experiences, loyal camaraderie, new discoveries, and deep reflection. Antique has put me under its charm, completely. Our stopover in Aklan made the travel time longer. But it also made the drive to Tibiao, Antique more rewarding, as we got to learn more about the sites that we visited along the way. Despite raining almost the entire day, the shady weather didn’t hinder us from moving forward with our schedule. TRIVIA: Tibiao, which comes from the local word “Tig-Bao”, means wild grass. Antique, on the other hand, comes from the local word Hantiqie, which means ants. Just an 8-minute drive from Kasa Raya Inn (my home in Antique) is the Kammamba Tibiao Pottery Workshop. KAMMAMBA, which is ‘Katilingban Kang Maninihon Kag Mangunguma Sa Bandoja’, means ‘an association of Brick Makers and Rice Farmers in Barrio Bandoja’. Ate Yolanda, who’s been on the job for 14 years, was our instructor at the workshop. She demonstrated how to create pots from scratch. She said that the sand that they use is sourced in the river, stepped on for 2 hours, and then mixed with clay. When the weather is hot, small clay products solidify within 3 days. But when it’s cold, these handmade items can take more than a month to dry up completely. Meet Ate Yolanda, a Potter at KAMMAMBA Tibiao Pottery. She manually showed us how to create a "clay masterpiece" from scratch, and explained to us how long each one takes to dry. When the weather is hot, small clay products can take around 3 days to dry. But when it's cold, expect to see results after a month or so. Small bricks, for example, are sold for PHP7 each, while big bricks cost PHP15 each. All finished products are air dried. Another local group worth visiting and supporting is the Malabor Abaca-Piña Weavers Association. Recognized as a registered organization for only two years, this union has already been in operation for 7 years. Ate Gemma, who is the current president, has been weaving since 1995. Ate Jennylyn, on the other hand, started using and working the ‘Tiral’ (loom) since she was 12 years old. MAPWA is also being funded by DOST-PTRI, and will be relocating to a bigger workshop soon. The finished products from MAPWA are usually made in 20-meter lengths, and in 25-30 meters if there are bulk orders requested. Some of their products consist of 2-meter shawls using Abaca, Silk or Piña. A shawl with a combination of piña & silk, but with more polyester blend would usually cost PHP500. A pure Abaca shawl would cost PHP500, while a pure silk & piña shawl would cost PHP600. *Factory prices are offered at the shop. Landmark: 5 minutes from Kasa Raya Inn (turn left before FilOil gas station). Passing through Tigbaboy Hanging Bridge (one of the two hanging bridges in Tibiao) is a great stopover before going to the Kawa Hot Baths. Tigbaboy, a 65-meter suspension bridge, is said to be the first of its kind in town. There's no entrance fee here. But it would take a lot of guts to cross the bridge, especially when it’s raining, as the raging waters from the river could get so loud (but surprisingly soothing). The boulders by the river are also a sight to behold. One can actually climb those when the weather is good and dry. 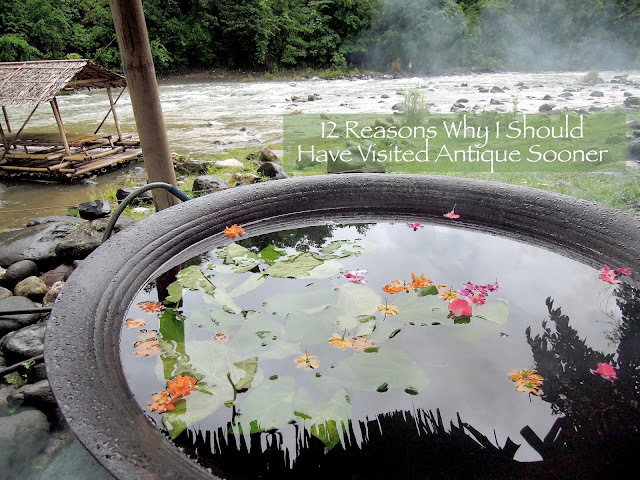 I’ve always known Antique as the home of the Kawa Hot Baths. Since then, I listed it as a must-see destination when I visit the province. When I finally did, it did not disappoint. The Kawa Hot Bath experience was an enjoyable one. It drizzled on our way to Blue Wave, which was a good thing because a hot soak felt good after getting drenched in the rain. But before anything else, we were walked through a step-by-step process -- from heating the gigantic iron cast wok to submerging in a warm water filled with local, medicinal herbs and flowers. It was a refreshing experience. Now, a 30-minute time limit is set per person. But my companions and I were able to stay in for more than an hour since there were no other guests in line. The water could get hot (but not at boiling point!). But don’t worry, as the caretakers will ask you on your preferred heat level. They will only keep the fire burning for photo purposes, or until your satisfied with the water’s temperature. TRIVIA: The Kawa used to be a cooking tool for cooking muscovado sugar. Nothing else will matter when you finally reach the beautiful Mararison Island (the sand was of coral tone, with fine to pebbly sand texture). Swim in the cool waters of Sulu Sea, and bask in the pure white sands of Kaw-It Sandbar. Mararison Island was quite memorable because of the people who I traveled with -- the amazing tour guides of Las Islas Travel & Tours: Jesan, Andrei, Pepe, Divine, and Noy. I’m grateful to have had them around, especially Jesan, as she helped appease my worries throughout the boat trip because the sea wasn’t all too calm. I felt every bumpy wave, as our small boat, which carried about 15 people, traversed the ocean. It probably took us around 15 minutes to finally dock on shore, as the waves were strong that day. Clearly, we visited during a time when the waves were intense. It was also super windy, as it was the kind that carried sand with it. Despite the conditions, we still managed to swim and enjoy its waters (though we would occasionally be wiped out by the groundswells). You’ll also find some wave breakers by the shore, which are both functional and aesthetically pleasing to the eyes. These were built to protect the community after Supertyphoon Yolanda hit the Philippines. 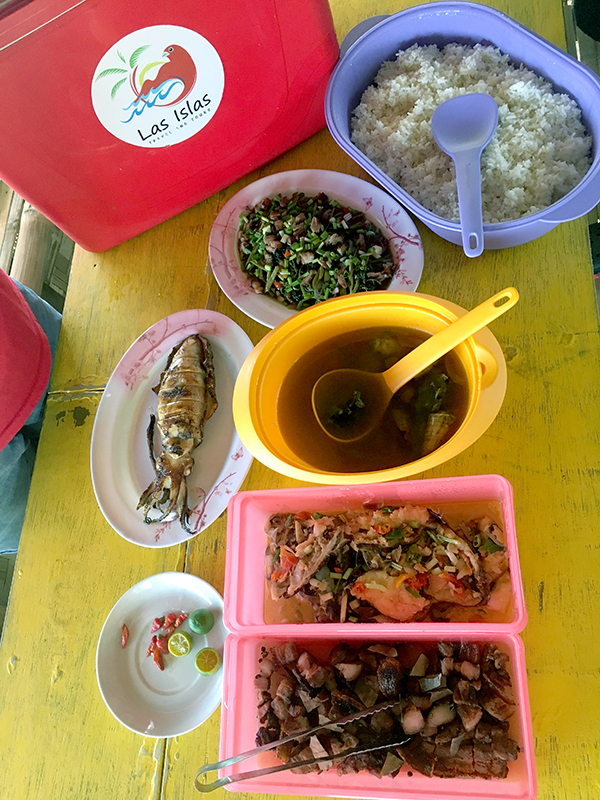 Our buffet lunch, which was prepared by Kuya Ronnie (the official partner of Las Islas in Mararison), consisted of grilled liempo, grilled squid, spicy adobong kangkong, and fish and soup with pasyak shells. Our meals were so hearty and flavorsome that I had to order a bottle of Coke to complement our food. Truly, nothing beats delicious Filipino cuisine! We had to head back after a few hours since the weather wasn’t that good. We also no longer got to climb Lantawan Hill, which we were told to have a gorgeous panoramic view of the island. I was actually excited to see the pitcher plants by the mountain. But I felt more eager to go back on land given the ocean’s condition. NOTE: When it’s habagat season, expect to reach Mararison Island from Lipata Port for about an hour, and 30 minutes going back to the port. If the weather is good, you’ll be able to reach the islet in less than 30 minutes if you’re coming from Culasi Port. Also, the fixed boat price is P750 for 5 pax. We had the pleasure of meeting a real-life ‘Panday’ (blacksmith) named Pato Martisano, an Antiqueño who’s been a blacksmith for 40 years. He and his assistants from Barangay Fe have been creating a variety of steel and farm tools, all of which takes days to create. The quality is definitely evident in each piece produced. They’ve been able to make a lot of metal objects, specifically used for farming like the Garab (Scythe), Wasay-Wasay (Axe) and Binangon (Machete). The Garab is used for harvesting grains, wheat, and grass, while the Machete is used for farming. The blades of the Binangon are also made from recycled automobile leaf springs. Mang Pato Martisano (in yellow sando) is an Antiqueño who's been a Blacksmith (Panday) for 40 years. He's been able to create a lot of metal objects, specifically used for farming like the Garab (Scythe), Wasay-Wasay (Axe) and Binangon (Machete). If you get the chance to see this cultural product, make sure to check the ‘bulak’, which is the engraving, as it’s the signature of the Panday. Also check the Polo, as it’s a type of holder that has wood carvings designed with a ‘Binuwaya’ (buwaya or crocodile) on it. And if you’re looking to purchase any of these products, you have the option to have it shipped locally if traveling via air. If you’re looking for a nice place to watch a beautiful sunset, then Tiguis Beach is the perfect place when visiting Antique. The warmth of the setting sun, amidst a serene background, is nothing short of amazing. Getting to this site is simple, as it’s easily accessible by the main road. Make sure to visit Tibiao Bakery (there’s another one in Culasi), as it’s the first bakeshop in Tibiao, Antique. Their tasty products, which all look appetizing consist of bread, biscuits and other pastries. But they also sell small snacks like siopao and hamburgers for customers on-the-go. Of course, don't leave without buying their Biscocho (P63/big pack), as it’s one of their bestsellers (it has a nice crunch and buttery taste to it). DIRECTIONS: From the second Petron from Kasa Raya, turn right. Turn left on the 4th street. REASON 9: I WENT RIVER TUBING AT MALUMPATI COLD SPRING AND IT WAS AMAZING! Malumpati Cold Spring is a must-see destination in Pandan, Antique. Not only will it offer a scenic view of its lush tropical forest (which you’ll discover when you do the short trek to the jump-off point), you’ll also get to experience Bugang River’s cool and clear waters (said to be the cleanest in the Philippines). Don’t forget to try Bamboo Rafting, Trekking or River Tubing with your family or friends, as these are some of the most exciting activities in Pandan. The more people joining, the merrier your journey will be. Take it from me. It was one of my best adventures yet! A must-see destination in Pandan, Antique, Malumpati Cold Spring offers its guests scenic views of its lush tropical forest, and cool and clear waters (Bugang River is said to be one of the cleanest in the Philippines). Once you're there, make sure to try River Tubing with your family or friends (the more, the merrier!). Believe me, it'll be one of your best adventures yet. Now, the trek towards the jump-off point for the River Tubing adventure is around 10-15 minutes. Each guest will have their own tuber in charge so you won’t have to worry about drifting by the river on your own. On a good day, you will find that the river water is an enchanting, greenish blue. I had a great time eating in Antique, as our gracious hosts at Kasa Raya Inn made sure we tasted as much local cuisine as we could. They made sure that we were served nothing but the most flavorsome meals, that getting extra servings of rice was a must! For breakfast, we were able to sample their homemade version of the Beef Tapsilog, Humbasilog and Adobosilog. Silog, by the way, means Sinangag and Itlog (fried rice and egg). For lunch and dinner, we were able to try the Chicken Porbida (Chicken Curry with a twist), Lapwa, Pinamarhan (fish cooked in vinegar until dry), Papisik (chicken that's traditionally cooked in clay pot that's wrapped in banana leaf, and cooked on top of a bed of salt), and Kilawin Humuy-Humuy. We also got to try Pandanon Restaurant where we ate Palabok, Grilled Chicken and Lomi. Kasa Raya (iraya means mountain) Inn, which means “house by the mountain”, is a charming lodging. I was honestly worried about what my 4-day stay would be like in Antique, knowing that I would be leaving all of the comforts that I'm used to. Surprisingly, the room that was assigned to me was cozy, which had the basic necessities. It was a no-frills lodging, as you would call it. Simple yet filled with a lot of character and passion. You'll know what I mean when you finally meet the owner (and chef! ), his lovely partner, his cute kids, and their Sheepdog, Charlie. Kasa Raya is the ideal countryside inn, my home in Antique. 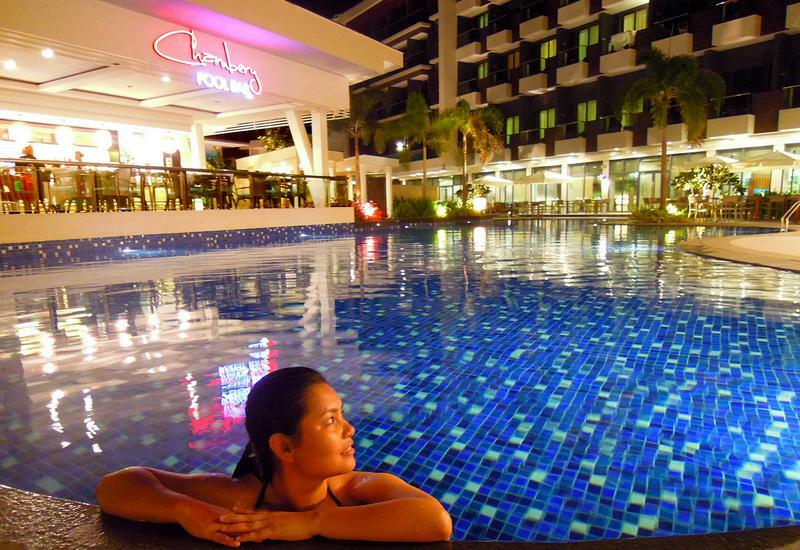 You can avail of a solo room for P999 or you can share a room for P500 per head (all inclusive of free breakfast). Also, note that the shower has no heater. But you’ll be surprised that the water is warm enough (not that cold on a September) for a bath. Moreover, the room that was provided for me had several electrical outlets, which I got to use to charge my gadgets. Extra toiletries (like toilet paper), towels and blankets can also be given upon request. 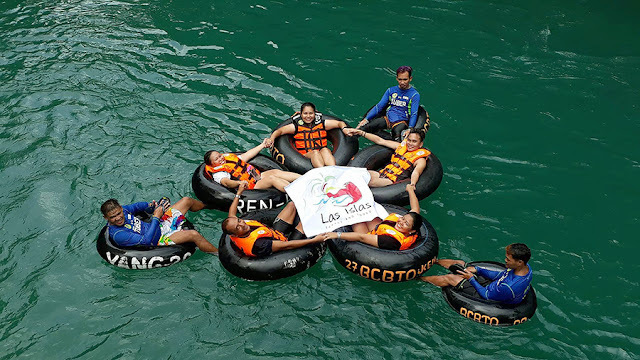 For a hassle-free travel, you should check out Las Islas Travel & Tours – a travel partner that you can trust. You won’t be disappointed with their services, as their tours are “expertly-designed and professionally executed”. Their trips are aimed to have a holistic experience for their guests because for them, it’s not only about going to a specific destination. It’s also having a complete experience, like an experiential immersion. You definitely won’t go wrong with Las Islas! While there are no direct flights to Antique from Manila, you can still reach the province via plane through Kalibo, Caticlan, Capiz or Iloilo. Local airlines like Cebu Pacific, Air Asia, and Philippine Airlines ply these destinations to Panay Island. From here, you can ride the bus or go on a private vehicle going to Antique. Based on experience, I flew to Roxas, and then we drove to Kalibo for an hour. We were on the road for an extra hour and a half before reaching Tibiao.